Winner of a 2015 Avery Fisher Career Grant, Michael Brown has been described by The New York Times as a “young piano visionary” and “one of the leading figures in the current renaissance of performer-composers.” Mr. Brown is equally committed as a pianist and composer; his unique artistry is reflected in a creative approach to programming that often interweaves the classics with contemporary works and his own compositions. In 2015 Mr. Brown joins The Chamber Music Society of Lincoln Center’s CMS Two program, through which he will perform with the Society both in Alice Tully Hall and on tour, including visits to Chicago’s Harris Theater and Boston’s Isabella Stewart Gardner Museum. Other highlights of his 2015-2016 season include a debut with the Texarkana Symphony and return engagements with the New Haven, Manchester, and Heartland Festival Orchestras; solo recitals throughout the U.S.; and concerts with his regular collaborators: cellist Nicholas Canellakis, violinist Elena Urioste, and clarinetist Alexander Fiterstein. Highlights of recent seasons include debuts with the Seattle and Maryland Symphony Orchestras; the New York Youth Symphony in Carnegie Hall’s Stern Auditorium; and the New Haven, Bakersfield, Santa Maria, Roswell, and the Juilliard orchestras. Mr. Brown has worked with such distinguished conductors as Alan Gilbert, Ludovic Morlot, Elizabeth Schulze, William Boughton, and David Commanday. He has appeared in Alice Tully Hall as winner of the 2012 Juilliard William Petschek Piano Debut Recital Award; Weill Recital Hall of Carnegie Hall; Wigmore Hall in London; the Louvre in Paris; Spivey Hall in Georgia; the Phillips Collection in Washington, D.C.; the Marlboro, Ravinia, and Gilmore Festivals; WQXR’s Beethoven Marathon; and the Jupiter Symphony Chamber Players in New York City. Mr. Brown has recorded several albums, including an all-George Perle CD for Bridge Records and a solo album for CAG Records. Recordings with pianist Jerome Lowenthal (four-hands), cellist Nicholas Canellakis (cello-piano), and violinist Elena Urioste (violin-piano) are all scheduled for release in 2015. A native New Yorker, Mr. Brown earned dual Bachelor’s and Master’s degrees in Piano and Composition from The Juilliard School, where he studied with pianists Jerome Lowenthal and Robert McDonald and composers Samuel Adler and Robert Beaser. His early teachers were Herbert Rothgarber and Adam Kent, and he has worked with pianists Leon Fleisher and Richard Goode. He spent three summers at Marlboro Music and has made appearances at the Ravinia, Caramoor, Moab, Manchester, Mostly Mozart, Music@Menlo, Music Mountain, Chamber Music Sedona, Rheingau Musik, Beijing International, and Kyoto International festivals. 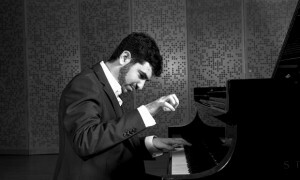 His awards include First Prize in the 2010 Concert Artists Guild Victor Elmaleh Competition; Juilliard’s Gina Bachauer Award; and prizes in the Honens and New York International Piano competitions. He was recently appointed Adjunct Assistant Professor of Piano at Brooklyn College. Mr. Brown is a Steinway Artist.